Wiping down glass is easier said than done. You might not think that there is a right way and a wrong way to do it, but there is always a special method to getting the results that you want. When you want the best results, brought to you by the best technique, all it takes is one phone call to our Gorillas. When you are noticing spots or streaks across your windows, our Halifax window cleaning service can help you to get rid of them. Getting a clear and streak-free shine, requires more than pushing a rag across the surface of your glass. In fact, simply wiping your glass with a rag or paper towel can leave surfaces looking dirtier than before. Hard wiping leads to static charge that attracts airborne materials. This can leave windows looking worse off after a cleaning than they did before. 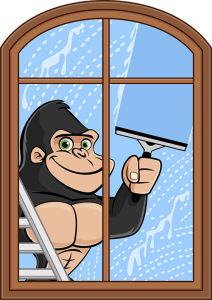 Since there is no point in doing a chore just to have it undone, call our Gorillas to have it done right. In order to achieve the best results for our clients, our Gorilla technicians use rubber tools, such as squeegees to clean off window panes. By using rubber, we neutralize the static charge and are able to keep windows looking cleaner, longer. Eco-friendly cleaning solutions treat your windows without the harshness of other chemical cleaners. By using these methods, our Gorillas are able to give clients a streak-free shine while extending the lifespan of your windows. A bit of routine maintenance here and there can prevent degrading and stall on the need for replacements. As with any property, there are hard to reach places around every corner. Some might be low, while others are high but our Gorillas are prepared for either. Whether it is by hand or by way of water-fed pole, our Gorillas can have your property looking great at every level up to four-storeys.